Nonprofit leaders, entrepreneurs, and small business owners have a second chance to acquire the skill to use LinkedIn to find customers, donors, investors, and volunteers. Participants who range from solo-preneurs to nonprofits leaders have been amazed at the immediate, practical usefulness of this course. Some people dismiss LinkedIn as just a place to post a resume, but it is a powerful way to make connections. LinkedIn for the Uninitiated in 4 Easy Steps, a virtual course offered by Ventureneer, gives solo-preneurs, small business owners, and nonprofit leaders (yes, they are running a business!) access to the benefits of LinkedIn without overwhelming them with techno-babble. When entrepreneurs and nonprofit leaders know how to use it, LinkedIn is a powerful, free tool for making the connections small businesses and nonprofits need. The price of the Ventureneer Vcourse is right -- $250 until May 8, then $300 -- and the results impressive. That's why Ventureneer is offering it a second time: It's back by popular demand! The class is affordable, convenient, practical and focused on the real-life situations of participants. "I had no idea that LinkedIn had such potential as a marketing and business development tool," says Jaci Hirschfeld of FY Eye. "Not only did I find the information presented in Ventureneer's Vcourse useful in expanding my organization's reach, but the clients I serve have benefited immensely." "Participants who range from solo-preneurs to nonprofits leaders have been amazed at the immediate, practical usefulness of this course," says Geri Stengel, founder of Ventureneer. "Some people dismiss LinkedIn as just a place to post a resume, but it is a powerful way to make connections." Ventureneer's reprise of its popular LinkedIn for the Uninitiated in 4 Easy Steps will be held Thursdays, May 20 through June 10, from 12 noon to 1 pm ET. The Vcourse, like Ventureneer's popular webinars on LinkedIn, will be taught by Marc Halpert, Managing Partner, Your Best Interest LLC. Emily Cox, of PowerwoRx was impressed by the "specific, detailed instructions and tips about how to maximize the LinkedIn profile networking tool." She adds, "Even though your target audience was nonprofit, there were tons of helpful information applicable to for-profit businesses, too." 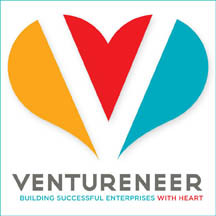 The Ventureneer Vcourse gives leaders of both small businesses and nonprofits an in-depth, hands-on experience that will result in a highly visible LinkedIn presence for their organizations. This is a practical, not a theoretical, course. Writing an effective LinkedIn profile, with feedback from the instructor. In just 4 weeks, with minimal homework assignments, participants will create and learn to manage their profiles in a way that attracts the people they want to reach from among the 50 million people who use LinkedIn as a business/networking tool. That's a lot of reach for only $250 (or even $300)! A LinkedIn discussion group will be set up so participants can network and converse beyond the confines of the course. And they'll know how to use it effectively. The Vcourse format allows both the quality learning and the peer support that business owners and nonprofit leaders need to succeed. It is flexible and convenient. Small business owners, chief executive and financial officers, solo-preneurs, and the marketing, public relations, development and executive staff of nonprofits will find useful tools in this Vcourse. For more information or to register, visit Ventureneer.